“Sweet Shenanigans” is the 2015 Rose Float theme. Pomona, Calif. operating with a budget of $258. Since then, the two schools have teamed up to create 67 floats with themes ranging from “Galactic Expedition” to “Guardians of Harmony.” When this year’s float, titled “Sweet Shenanigans,” rolls down the 5.5 mile route in Pasadena next month, hundreds of students from both schools will join the millions of television viewers to watch the parade’s only entry designed and constructed entirely by full-time students. Since both universities emphasize a “learn by doing” philosophy, Cal Poly Rose Float program lead Ian Davidson says that this project is a perfect example of a polytechnic program. “We have many, many technical disciplines involved in the construction of the float and that is literally the etymology of polytechnic. It should be the poster child program for Cal Poly because of the “learn by doing” aspects and its interdisciplinary nature,” Davidson said. One of those “learn by doing” aspects is building a professional-level float with a team of students, Cal Poly Rose Float decorations chair Cecilia Allor said. “We’re building this float from the ground up and there’s not really any involvement from staff or other people. It is all designed, decorated and planned by students. We’re the only college that does anything like this,” Allor said. Over the past few decades, the two universities have received 45 different awards for theme, animation, humor, decoration and viewers’ choice award. Last year the universities earned the Lathrop K. Leishman Trophy for the most beautiful non-commercial float for their 2015 submission “Soaring Stories” that included a castle and a flying griffin. John Catalano explains how the two universities work together. “This float ‘Sweet Shenanigans’ is gummy bears playing in a winter wonderland enjoying the fun times. It’s a more whimsical, playful, cartoonish float. This theme is kind of what Cal Poly is known for. You look at this and you just want to smile because it’s so cute,” Catalano said. Since they began participating in the competition, Cal Poly Universities have been responsible for being the first to introduce a lot of new technologies in the parade, including the first use of hydraulics for movement, front wheel drive, and propane for cleaner emissions, according to the Robert E. Kennedy Library’s University Archives. 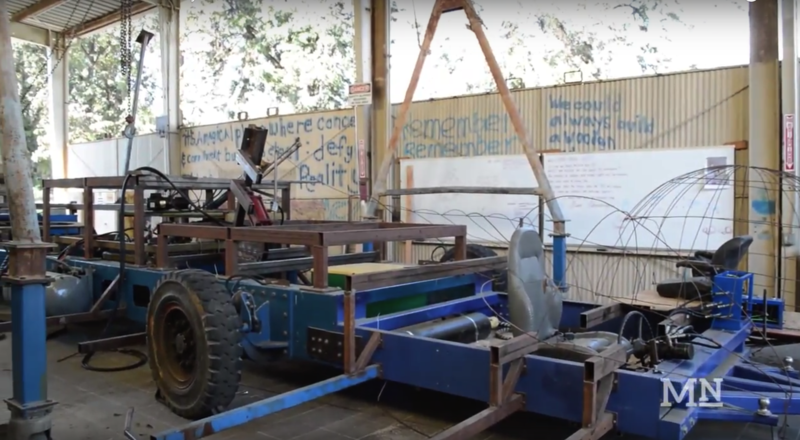 “One thing Cal Poly universities is known for in the float world is that we are innovators. We aren’t scared to go out and try something. We’re responsible for a lot of new things that a lot of rose float builders use,” Catalano said. “One of the gummy bears is going to be launching a snow ball across the float. It’s new to have a projectile launch out and recycle through the float,” Catalano said. The 2016 float will also include a skating gummy bear, giant lollipops and ice cream cones and scoops of ice cream among other things. The Rose Float program is one of the key programs that continues to connect both Cal Poly Universities, Cal Poly Rose Float adviser Josh D’Acquisto said. There are about 50 students from both campuses that have committed to the 12-month role with the Rose Float, he said. Each campus has a program lead and assistant program lead as well as three chairs for the float: design, construction and decorations. Although the students in leadership positions communicate often with the corresponding student at the other university, there are some challenges that arise. “It’s a communication challenge because they are 300 miles away and we don’t see them for half the year. The biggest challenge is communication, making sure that they know what we know and that our plans coincide with their plans and that we’re lined up for the same goal,” Davidson said. One of their biggest donations is for the fresh flowers that cover the float. The tournament requires that all visible parts of the float must be covered in organic materials, including but not limited to fresh flowers, dried flowers, tree bark, vegetables, plants, etc. This year they are expecting to use about 45,000-50,000 fresh flowers. 100 percent of those flowers are expected to be donated by the California Cut Flower Commission (CCFC), Allor said. The CCFC is an organization that partners with flower farmers throughout California. They work with the Cal Poly Universities and coordinate the donation of fresh flowers to the universities’ float. In order to be certified as “California grown” a float must source a minimum of 85 percent of flowers grown in the state. Cal Poly Universities’ float was the first to be certified as “California grown” four years ago and have been certified each year since then. This year will be their fifth time expecting to receive that certification. D’Acquisto said that the parade started as a way for California to show that flowers could be grown here year round, however, most of the roses used in the parade today come from Central and South America. He says that supporting California farms is important to the Cal Poly Rose Float. “It’s important for two California agricultural universities to align themselves with the California grown movement and in-state agriculture. We promote California grown,” D’Acquisto said. Anh Nghiem is the Cal Poly Pomona decorations chair. She and Allor meet to discuss what organic materials they will use to cover the visible parts of the float. Selecting the right material is important because the audience will understand what the different components of the float are, Nghiem said. “We have to keep in mind to match the color and texture because we have about 3-5 seconds of the audience’s full attention on parade day. So we try our best to make it as simple and straightforward as we can so they can enjoy the float too,” Nghiem said. The float for 2016 will include a variety of fresh flowers including roses, daisies, and mums. It will also include other materials such as seaweed, statice, and almond bark. Students from both universities and more than a thousand volunteers add these materials on the float during decoration week in late December to get it ready to be shown during the parade. Allor describes the moment when she sees the float they’ve worked on come down the parade route. “I started crying, half of it was from sleep exhaustion. It’s amazing, just everything you’ve worked for the whole year. Everyone is screaming their heads off, they’re so excited. There’s no way to describe it, you have to be a part of it. It’s like your baby coming down those parade routes,” Allor said.